‘Tis the season to be jolly! Yep, the holidays are officially here. Your neighbors have set up their outdoor light displays, and yes, that really was “Chestnuts Roasting on an Open Fire” you heard playing over the sound system at the pharmacy yesterday. This can only mean one thing… Christmas is just around the corner! There’s no better way to welcome the season than making some homemade treats side-by-side with the kids. Not only will little ones love these holiday-themed treats (even those with picky palates), but health-conscious parents will too. So, put on your apron and break out the jingle bells to get into the Christmas spirit as you make these treats with your wee ones! Even if your kids are serious after-school grumps, these Christmas grinches are sure to turn their frowns upside down. All you need for these fun pops are some grapes, bananas, strawberries, a few toothpicks—and you’re off! You and your kids will have a blast drawing Grinchy faces with a chocolate pen, which are widely available at craft and baking stores this season. Commercial icing scribblers will also get the job done. For the less sugar-averse, optional candy hearts can be added to create pom-poms at the top of the Grinch’s Christmas hat. For a truly sugar-free version of this treat, simply drop the hearts and add scribbled mugs. 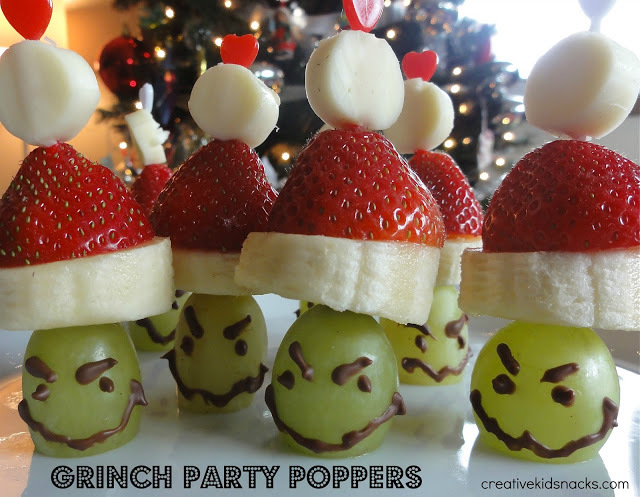 Either way, these party poppers are sure to make smiling angels out of your little Grinches! 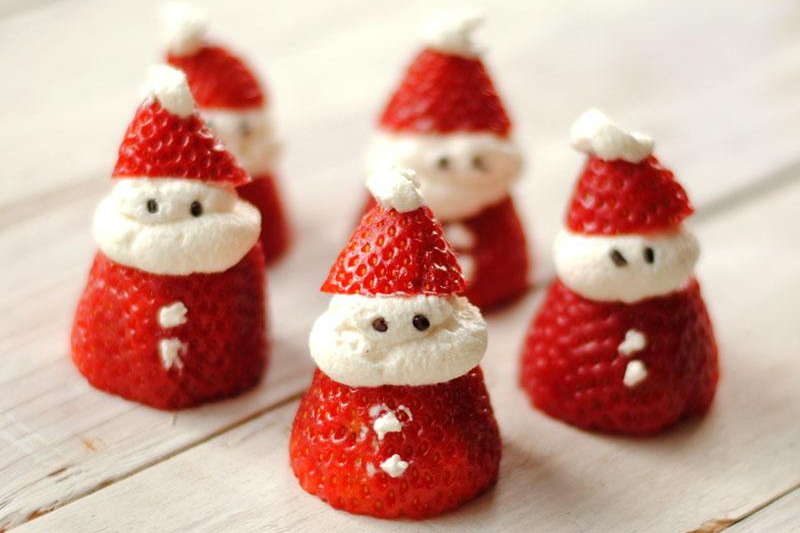 How cute are these little Santas?! All you need are some strawberries and a little whipped cream, and you’re well on your way to creating your very own little helpers. A variety of stuff you might have on hand can serve to make the eyes on these little guys, but chocolate sprinkles work best. If you want to really impress your guests, you can take this idea up a notch by surrounding these guys with a beautiful Christmas tree fruit salad. And then just serve these ‘lil Saint Nicks up on a platter! If you’ve been hunting around for a truly unique Christmas wreath, look no further than this edible version! Simply rifle through the fridge for staples you’re sure to have on hand like celery, cucumber and carrots. Then chop them up and arrange them into a charming wreath on your child’s plate. Other items can be added if you’ve got them taking up space in your fridge, including lettuce for more greenery, or strawberries and cherry tomatoes for more faux holly berries. 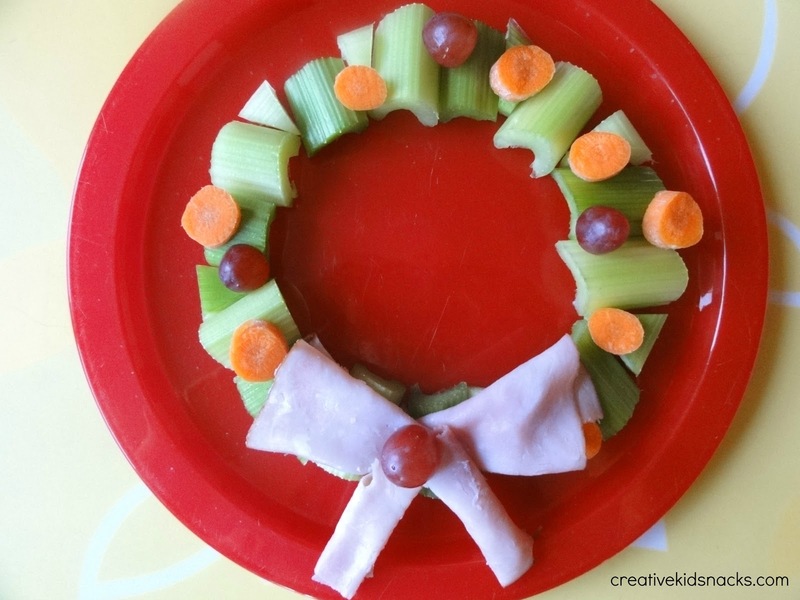 Add a “bow” of sliced ham or turkey, and your hungry kids are sure to be tickled pink with this healthy and colorful holiday lunch! 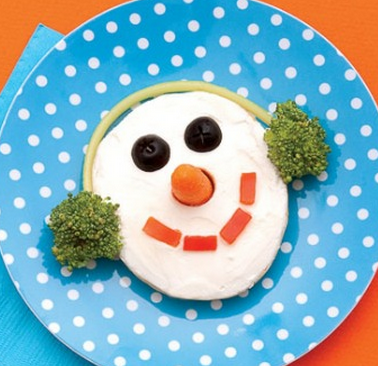 For added appeal, Moms can add a “side of snow” with a white healthy dip of choice. For an even more filling lunch, simply add “snowy” cottage cheese in the middle of the wreath (or on the side). Yum! Is anything better together than bananas and chocolate? These goofy little Christmas penguins have traveled all the way from Santa’s workshop in the North Pole to entertain (and nourish) your kiddies! 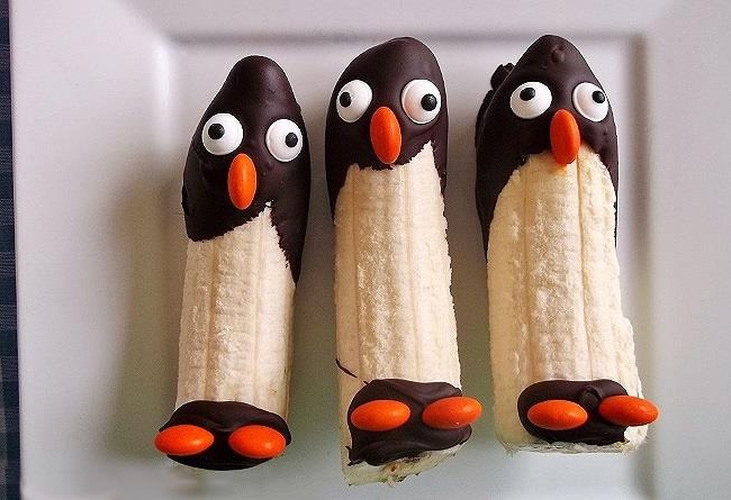 Just dip half a banana into melted chocolate, add M&M’s for feet and beaks, and candy eyes to complete the hilariously confused gaze of these tasty birds. No candy eyes on hand? Mini marshmallows with mini chocolate chips stuck into the middle make great substitutes! There’s nothing cheesy about these beautiful pops—they’re simply full of flavor! Just pick the cheese of your choice, cut it up into small triangular wedges, press broccoli floret bits and chili peppers into the slices and stick the finished product onto cocktail sticks. 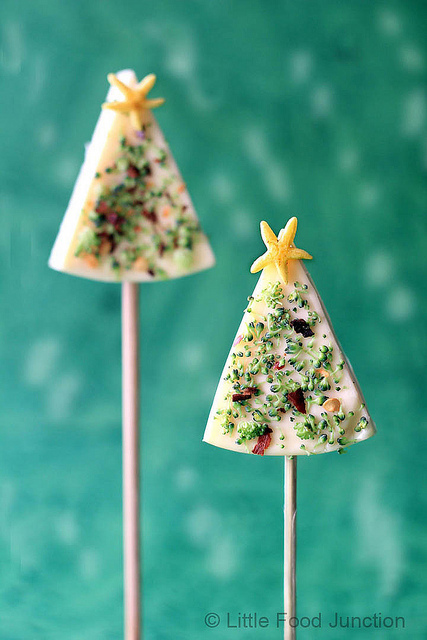 Top off your little trees with savory stars, and you’ve got a delightful snack for your hungry little crumb snatchers! Kids love watermelon no matter how you slice it. So, why not take advantage of this simple, sweet treat and its naturally festive colors? Your kids will likely need help cutting out these shapes, but they won’t need any help gobbling up this healthy snack. To make your melon trees just a little “naughtier,” why not throw on some “snowy” whipped cream? 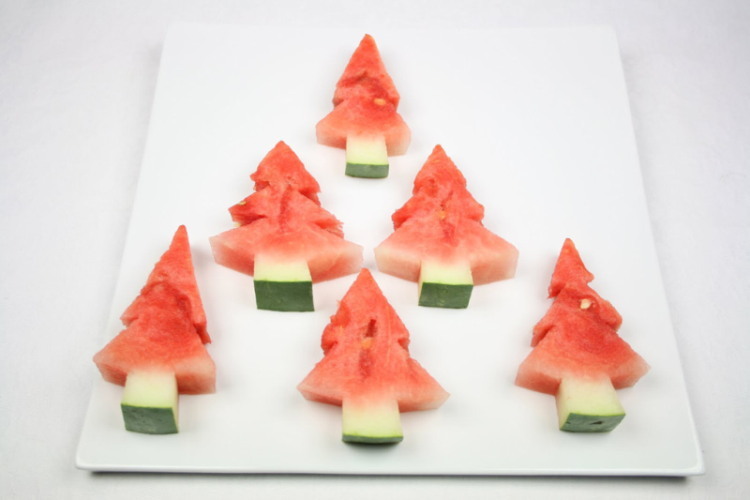 Looking for a fun way to get your kids to eat a healthy snack and do a Christmas craft all in one sitting? 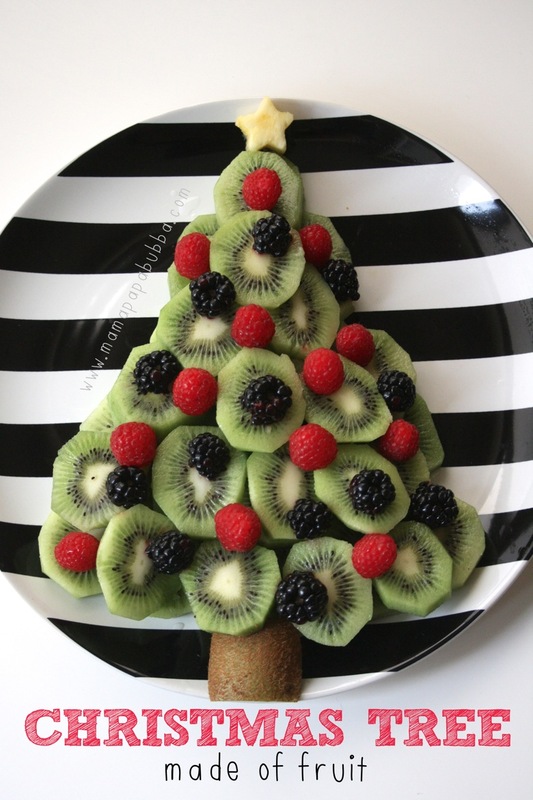 This fruity Christmas tree is the answer! All you need to get started is a couple of kiwi fruits, assorted berries and a pineapple (for the tiny tree-topping star). Just slice up the kiwi and help your kids place the slices on top of each other in the shape of a tree. A kiwi skin, or half a kiwi sliced lengthwise, makes a great “trunk” for your tasty tree. No kiwi fruit on hand? A cucumber makes a great replacement in a pinch. Raspberries and blackberries are used in this version, but you can also swap those out for blueberries, strawberries or grapes. And no need to buy a whole pineapple for the star; a slice from a tin works just fine. Failing that, a piece of cheddar cheese could also serve as a gleaming tree topper. Tired of cutting the crusts off your kids’ sandwiches and tossing them in the garbage? Instead, keep them to make Rudolph’s antlers! 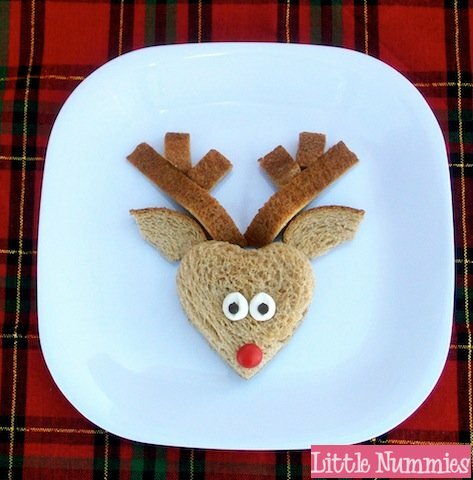 All you need for this adorable reindeer sarnie is a couple of slices of whole grain bread, some delectable deli meats or other filling to put in between your bread, some mini-marshmallows topped with mini-chocolate chips for the eyes, and one M&M or Smarties for the nose (red’s best for Rudolph’s schnoz, but any color could work). Now all that’s left is to lead your little one in a verse of “Rudolph the Red-Nosed Reindeer” as your tyke enjoys their festive lunch. Get “Frosty the Snowman” lined up on your iPod and start singing along as you and your kiddies make these fun little snowmen bagels of your own! Start by spreading a bagel half with a generous helping of your favorite “snow”— also known as cream cheese. Red peppers make the mouth, with blueberries or olives as the eyes and a traditional baby carrot in center stage as Frosty’s nose. And to help keep your kiddie’s edible snowman extra warm, use broccoli florets and shaved celery string (created using a veggie peeler) to make bagel-sized earmuffs. With some many tasty options, you’re sure to catch the Christmas spirit as you prepare these healthy snacks with your very own Christmas angels! Do you have other holiday-themed treats you make with your little ones? Share your thoughts in the comments below. Previous articleMotheringEnter Our Letters to Santa Contest! Love the ideas for the fruits and vegetables. My grandson will be thrilled to help. Even as a died-in-the-wool vegan I’m delighted. Thank you! These are great ideas for holiday- and winter-themed meals and snacks for toddlers. They look fun and easy to make, too. Some great ideas for my granddaughters who have allergies to dairy.